The Wood Slicer does it again! I want to give you feedback on a product I purchased recently. Last week I received a 3/4″ x 105″ Wood Slicer. I was very pleased when I received it so soon after ordering!! I had saved some beautiful Cherry Laurel from a fallen tree and looked forward with great anticipation to sawing it into planks for gift boxes. I installed the blade on 14″ Delta bandsaw with risers. The instructions that accompanied the blade were indispensible since this was my first venture into resawing. I could hardly wait to see how it would go. I was flabbergasted at what I felt and saw as I pushed the rough-cut piece of log through the blade. The cut was so easy, and the wood tracked through the blade straight as an arrow. I did not have to make any allowances for drift or blade curvature!! I almost cried it felt and looked so good. The sides of the cuts looked like they had been through a planer or jointer, no blade marks whatsoever! So, I just wanted you (and other customers who might wonder if all of your claims for the Wood Slicer are true) to know – I can say that they most certainly are! 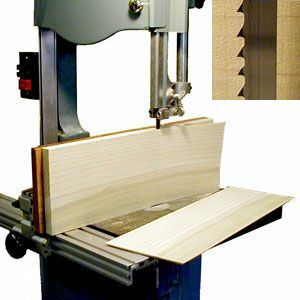 We at Highland Woodworking are very proud to carry such a quality product as the Wood Slicer. Thanks for your comments!